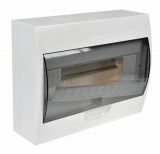 Distribution box for circuit breakers, 2x12 modules, surface mount, IP40, white, Easy9, SCHNEIDER, EZ9E212S2S 24-way (2x12) consumer unit with E/N terminal block Easy9 from Schneider Electric designed for surface installation on the wall suitable for residential and commercial buildings. Smoked front cover reversible at 180°. Heat and impact resistance body made of self-extinguishing plastic. Complies with IEC 60670-1-24. Distribution box 18, Easy9, SCHNEIDER, surface mounting, white, EZ9E118S2S Flush mounted fuse box 18 modules from SCHNEIDER ELECTRIC (Easy9) suitable for residential and other type of buildings. Opening angle of the front cover - 150˚. Heat and impact resistance body. Complies with IEC 60670-1-24. Distribution box 12, Easy9, SCHNEIDER, surface mounting,white, EZ9E112S2S Flush mounted fuse box 12 modules from SCHNEIDER ELECTRIC (Easy9) suitable for residential and other type of buildings. Opening angle of the front cover - 150 ˚. Heat and impact resistance body. Complies with IEC 60670-1-24. Surface Enclosure box 1 row, 8 modules, IP40, white, EZ9E108S2S, Easy9, SCHNEIDER Surface wall mounted fuse box 1 row 8 modules from SCHNEIDER ELECTRIC (Easy9) suitable for residential and other type of buildings. White body with transparent door. Opening angle of the front cover - 150 ˚. Heat and impact resistance body. Complies with IEC 60670-1-24. 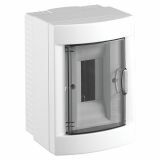 Flush Enclosure box, EZ9E212S2F, 2x12 modules, SCHNEIDER, white Flush mounted enclosure with 24 modules from SCHNEIDER ELECTRIC (Easy9) suitable for residential and office buildings. Opening angle of the front cover - 150 ˚. Smoked color door. Heat and impact resistance body. Complies with IEC 60670-1-24. 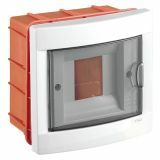 Flush Enclosure Box, EZ9E118S2F, 18 modules, Easy9, SCHNEIDER, white, Flush mounted fuse box 12 modules from SCHNEIDER ELECTRIC (Easy9) suitable for residential and other type of buildings. Opening angle of the front cover - 150 ˚. Smoked color front door. Heat and impact resistance body. Complies with IEC 60670-1-24. 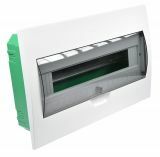 Flush Enclosure box, EZ9E112S2F, 12 modules, Easy9, SCHNEIDER, white Flush mounted fuse box 12 modules from SCHNEIDER ELECTRIC (Easy9) nsuitable for residential and other type of buildings. Opening angle of the front cover - 150˚. Smoked color front door. Heat and impact resistance body. Complies with CE and RoHS. 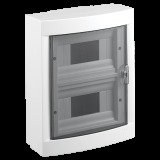 Flush enclosure box, EZ9E108S2F, 8 modules, Easy9, SCHNEIDER, white Flush mounted fuse box 8 modules from SCHNEIDER ELECTRIC (Easy9) suitable for residential and other type of buildings. Opening angle of the front cover - 150 ˚. Heat and impact resistance body. Complies with IEC 60670-1-24. 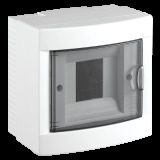 Distribution box, 4 modules, white, flush mounting, VIKO by Panasonic, 90912004 Flush mount distribution box with terminal and 4 modules for secure installation at home. Distribution boxes from VIKO by Panasonic are with heat and impact resistant body with protection up to 650˚C. Covers can be opened over 180˚ so are very easy to use. 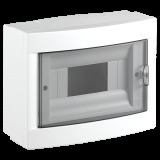 Distribution box, 6 modules, white, flush mounting, VIKO by Panasonic, 90912006 Flush mount distribution box with terminal and 6 modules for secure installation at home. Distribution boxes from VIKO by Panasonic are with heat and impact resistant body with protection up to 650˚C. 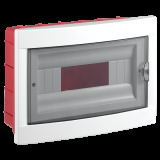 Covers can be opened over 180˚ so are very easy to use. Distribution box, 12 modules, VIKO by Panasonic, white, 90912012, flush mounting Home Switch Board, 12, flush mounting. Distribution box with 16 modules, 2 rows, VIKO by Panasonic, 90912016, flush mount Distrbituon box for flush mounting from VIKO by Panasonic with 2 rows and 16 modules. Tranparent door and orange back panel. Heat and impact resistant body made of PVC material with high degree of insulation. Distribution box, 2 modules, VIKO by Panasonic, white, 90912102, surface mounting Surface mounted fuse boxes with 2 modules. VİKO quality and standard available in 2-, 4-, 6-, 8-, 12-, 16-, 18-, 24- and 36-unit options combine both safety and design quality. Meet all international safety and quality standards. 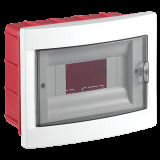 Distribution box, 4 modules, VIKO by Panasonic, white, 90912104, surface mounting Surface mounted fuse boxes with VİKO by Panasonic quality and standard available in 2-, 4-, 6-, 8-, 12-, 16-, 18-, 24- and 36-unit options combine both safety and design quality. Suitable for residential and office buildings. Protection degree is IP40. Distribution box, 6 modules, VIKO by Panasonic, white, 90912106, surface mounting Home Switch Board with 6 automatic switches, outdoor installation convenient button for opening. 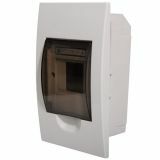 Distribution box, 8 module, VIKO by Panasonic, white, 90912108, surface mounting Surface enclosure box VIKO (Lotus) with 8 automatic switches designed for surface installation in residential and office buildings. Distribution box, 12 modules, VIKO by Panasonic, white, 90912112, surface mounting Surface mounted fuse boxes (Lotus) with 12 modules. VİKO quality and standard available in 2-, 4-, 6-, 8-, 12-, 16-, 18-, 24- and 36-unit options combine both safety and design quality. Meet all international safety and quality standards. 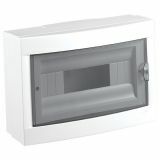 Distribution box, 16 modules, VIKO by Panasonic, white, 90912116, surface mounting Distribution box with 16 automatic switches for surface installation with convenient button for easy opening. Surface Distribution box, 4 modules, MD-4F, white color Home Switch Board MD-4F.